The fewer the angles, the less costly the house is to build. But how exciting can a flat-roofed, boxshaped structure be? With creative design, very. As evidenced by architect David R. Kingwill's house in Sebastopol, Calif., simple geometric forms can generate visual and spatial drama even when size is limited. 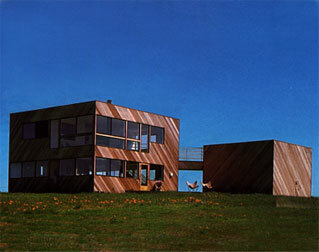 The house measures 30' x 30' and encompasses 1,450 sq. ft., but its open interior and glass expanses imbue it with a feeling of free-flowing space that transcends its symmetrical, modest dimensions. The exterior of the structure, consists of two cubes connected by a deck on the lower level and a bridge with pipe railings on the second level, inset below. The smaller form is the garage with rooftop sun deck, and the larger, is the two-story house. To maximize views and create architectural interest, the two forms are placed at an angle to each other with the main entry, situated in between. In conjunction with the deck and bridge, the entry opening frames a view of the hills to the south. Diagonal redwood siding underscores the forms. "A museum for the outdoor environment" is how architect Kingwill aptly describes his house. The effect is created by the all-white interior, above, which is surrounded by rows of recessed windows that frame views of the landscape. To cut costs and create an illusion of capaciousness, the interior is virtually devoid of structural partitions; only the private living quarters on the upper-level balcony and a lower-level bath are walled in. Fitted into the open space at an angle, the balcony, above right, gives relief from the cube shape and provides the only animated lines within the serene enclosure. The slant is repeated in the hemlock flooring placed on a diagonal. 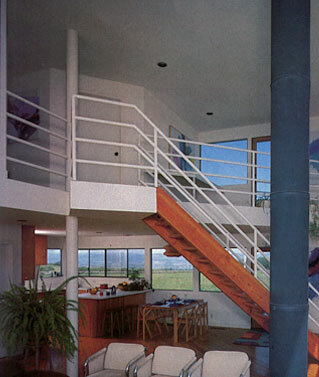 Like the pipe railing, stair risers are open to enhance the flow of space and light. Fenestration abounds on the south and west elevations, allowlng the sun to heat the interior. In addition to energy savings, construction costs were further minimized by building entire walls on the ground and then jacking them up in one piece.